Apparently, the real Niki Lauda loved Daniel Brühl's performance so much, even praising the effort Brühl took to perfect the Austrian accent. To have the person you're playing compliment your performance─that's the highest compliment an actor can ever receive. The best trick that the Director of Photography pulled here was making digitally-shot footage look like film. The grainy images and rainbow lens flares actually add a lot to the visual texture, and we can thank Dod Mantle's use of camera lenses made in the 1960s. Because real life is better than fiction. This is the first time I've appreciated the work of screenwriter Peter Morgan, whose previous works include Frost/Nixon and The Last King of Scotland. 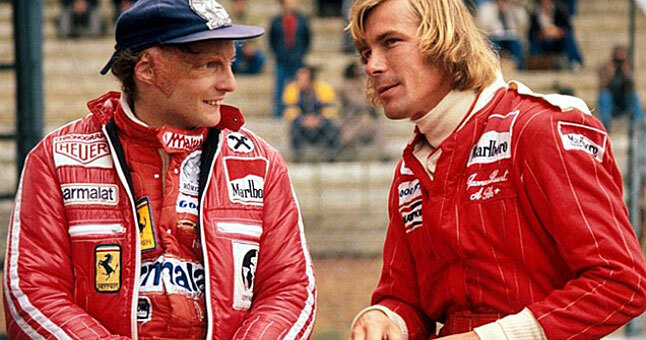 Character development here is superb, the Lauda-Hunt tension very authentic, and the rivalry, albeit a bit exaggerated, was captured spot-on that even the real Formula 1 community loved it. Hopefully, existing petrolheads will be proud of Rush. Conversely, we also hope non-F1 fans will realise what they're missing by not following the fastest motor race in the world. Special thanks to me alone, coz I was the one who made you watch _Senna_, too. Hahaha! No thanks to your failed italics, though. Hehe.